Determination of the residual stress state in a loaded automotive component is highly important because of its strong effect on the lifetime of the element. Nowadays, the residual stress characterization of products became an everyday requirement in the automotive industry, and the quality control is impossible to imagine without it. Forasmuch as every producing process (casting, heat treating, different kinds of metal deformation processes and surface compressing methods, etc.) influences the residual stress state, therefore it can be very complex and various within the materials. If we conscious in the effect of these processes it is possible to reach such a state in the material which can enhance its lifetime and quality, and with an optimized process, the costs could be reduced. Several methods exist for measuring the residual stress and each of them has its own advantage and disadvantage. With this paper our purpose is to introduce nowadays’ available stress measuring methods such as X-ray diffraction, magnetic Barkhausen noise and the hole drilling methods and a few more alternatives. Some useful results from the practice are also presented. 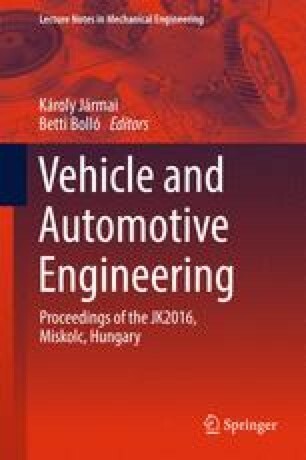 The described article was carried out as part of the EFOP-3.6.1-16-00011 “Younger and Renewing University—Innovative Knowledge City—institutional development of the University of Miskolc aiming at intelligent specialisation” project implemented in the framework of the Szechenyi 2020 program. The realization of this project is supported by the European Union, co-financed by the European Social Fund. The research work of Mate Sepsi was supported through the New National Excellence Program of the Ministry of Human Capacities.